10am to 6pm Monday to Friday and 11am to 1pm on Saturdays. Closed on Bank Holiday weekends. 'Bram's work is at the same time absolute abstract and completely aliveâ¦It has been able to give a purpose to my life'. So it was that Marcel Paquet introduced the last exhibition of Bram Bogart's new work in London some seventeen years ago. This November Bernard Jacobson Gallery is proud to announce the first exhibition of new work by Bram Bogart since 1990. Born in 1924 in Delft, the Netherlands, Bogart made his way as a painter with little formal training. Following early experiments with cubism and figuration, the 1950s saw the artist working in thick impasto developing his tachiste application in monochromatic grounds of pure colour. By the 1960s experimentation with materials led Bogart to arrive at the use of a concrete-like mixture, which he continues to employ to this day. Mixing a diverse range of substances including a wide variety of oils, varnish, mortar, raw pigment, siccative, powdered chalk and water Bogart had discovered a means of applying extremely thick layers of colour with a diverse range of textural qualities. Such layers can be spread over wide surfaces in continual strokes or daubed in short blobs, allowing the build up of a sophisticated surface structure which Bogart terms the 'script' of the work. 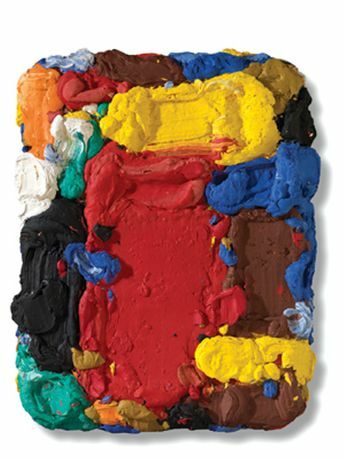 In its radical expansion of the material possibilities of painting Bogart's work can be linked to that of his friends and contemporaries Alberto Burri, Antonio Tapies or Lucio Fontana (whose canvases still lie around Bram's house and studio following their exchange for his own in the 1960s). Further, by creating works in which the canvas seems to expand indefinitely in all directions merging and eventually surrendering its autonomy to the paint itself, Bogart's work challenges the notion of prescribed media specifity in a manner foreseeing the post minimalist work of Eva Hesse or Keith Sonnier. The work on display at Bernard Jacobson Gallery remains, like Bram's career, a testament to his unique and single-minded breed of abstraction. There is a diversity of scale and even medium, with some smaller experiments in thickened gouache resting alongside some of the largest works of his career, Le Grande Chaumiére, for example, is some 250 cms wide, approximately 20 cms thick and over 270 kg in weight. There are calm, harmonious, monochromatic works alongside busy, pulsating essays in colour harmony. Throughout, however, there is the balance of touch and composition, colour and structure, material and content, weight and joy that has given Bram Bogart his esteemed reputation. Bogart's work is included in many major collections. The artist now lives and works in Belgium. This exhibition shows a fine painter, still at the peak of his creative powers wrestling with the issues that have occupied his art for forty years.